According to the latest federal figures, there are more than 1,200 endangered species in the United States. Scientists across the country are trying to figure out ways to keep many of these species from dropping off the face of the Earth. Walking down the steep trail towards the bottom of Chittenango Falls in central New York, Cody Gilbertson carries a big white styrofoam cooler. But there aren’t any picnic treats for humans inside. Gilbertson’s cooler is filled with several plastic containers, stuffed with leaves that endangered Chittenango Ovate Amber Snails are munching on. "These are New York’s most endangered species," said Gilbertson. There are only about 300 of the Chittenango Ovate Amber Snails left in their natural habitat. U.S. Fish and Wildlife Service biologist Robyn Niver counts only 300 of the tiny amber snails left in their natural habitat, along a grassy shoreline in the shadow of the thundering Chittenango Falls, part of the New York State Parks system. The goal is to avoid extinction, by boosting those numbers past 1,000. "There was a decline a few years ago after a rock slide, and what we’re trying to do is get it back up and stabilize it," said Niver. Championing this task is a group of students from the SUNY College of Environmental Science and Forestry. Led by Gilbertson, a graduate student, the scientists in training have been pushing the snails to propagate in plastic deli containers. "This container has a couple of holes poked in it, so it keeps humidity up to 100 percent," said Gilbertson. "So this keeps the leaves wet, and this is the environment they thrive in." But progress has moved at a snail’s pace. 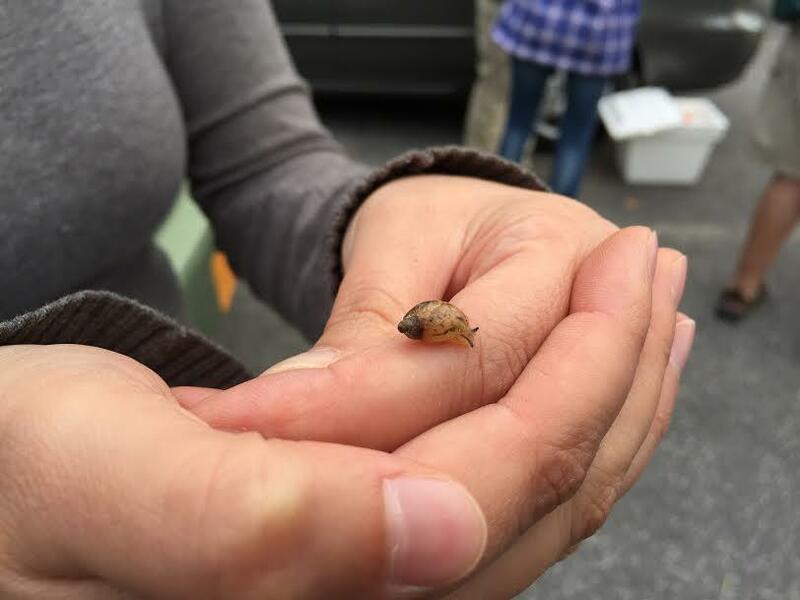 Over two years, Gilbertson’s crew found snails weren’t thriving in the containers. So, left with one tiny, adolescent snail, they offered different kinds of leaves for dinner. And when they stuffed a cherry tree leaf in the container, the snail’s growth took off. 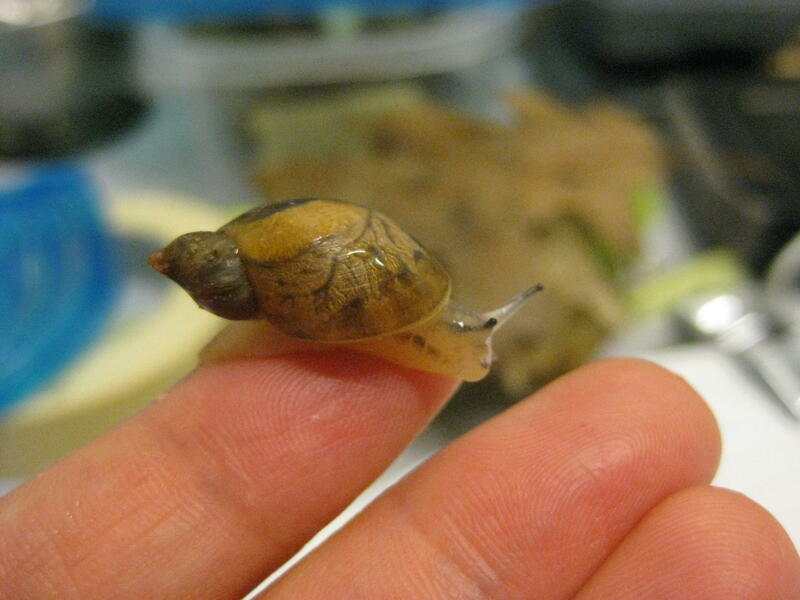 "Once it got to an adult size, this summer, I brought in a few more snails," said Gilbertson. "And immediately when I brought the adult snails in, they mated, and then I have upwards of 200 eggs per snail that I brought in." So on an overcast October day, Gilbertson trudged down the trail to the base of the falls, to leave a couple of hundred of the snails, tagged with a tiny numbers, along the shores of the creek, where they thrive in the spray zone of the 167-foot waterfall. "I’m going to release the Chittenango babies that I bred in captivity," she said. "They’re most likely not going to run away, but they know they’re outside in the wild." Niver says they’ll be monitoring the snails numbers. "What makes or breaks it continuing, could be additional rock slides, invasive species," said Niver. "What we’re trying to do is get a large enough population out there that it’s resilient to any of these threats they may face." 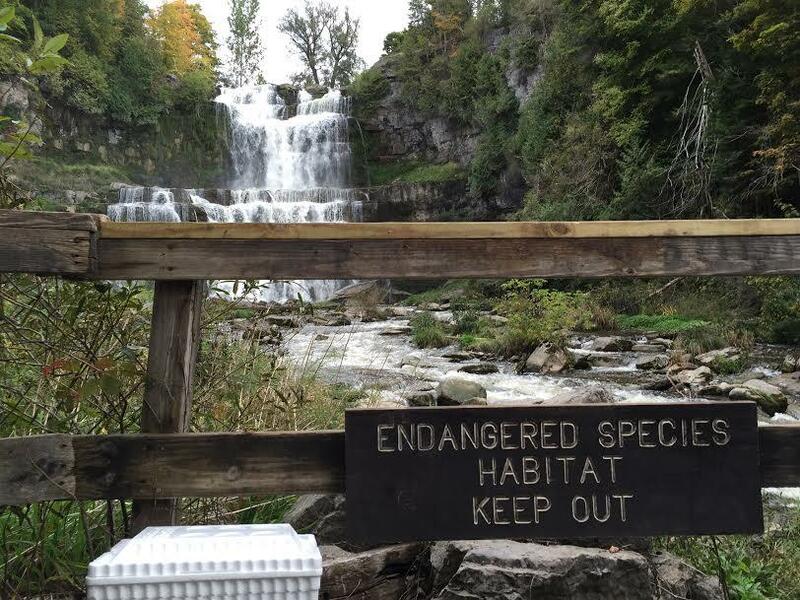 The pubic is warned of the snails home by a big New York State Parks Department sign and state natural resource stewardship biologist Tom Hughes says the endangered species can thrive in the same place families picnic and take snapshots of the falls. "One of our main missions is to strike a balance between our natural resources and our recreational resources," said Hughes. "And it’s a high priority to protect native species biodiversity and the integrity of our native ecosystems." As for Gilbertson, she still has 400 snails back at school. Plans are to split them up between a couple of area zoos, to have a few on hand in case something happens to the natural population. Over this two-year process, she says she learned more than just how to propagate a species. "They’re really beautiful, said Gilbertson. "The coloration is amazing. They’re just slow moving and curious, and they do have personality." Does Gilbertson think the snails provide a lesson for the rest of us? "I think it’s nice to slow down sometimes in life," she said.